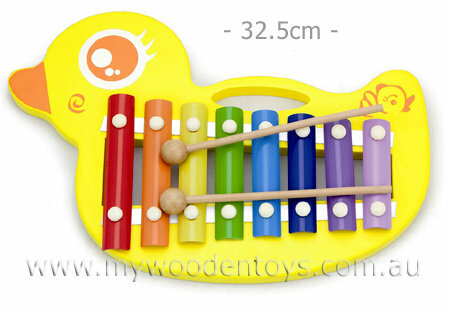 Wooden And Metal Xylophone Duck is a lovely colourful play musical instrument with eight metal keys, two chunky beaters and all attached to and supported on an easy to carry wooden duck shape. This Xylophone is very solid and will withstand some heavy playing. It is rated for 18 months +. This xylophone progresses from lowest to highest over 8 metal notes and has a pleasant tone. This is a great first play xylophone for a young child where solid construction is important. Material: Wood, Child-safe paint, Metal Keys. We like this because: "Great first xylophone"